So you've heard of Mickey Hart, right? The Greatful Dead drummer. Ran across mention of an explosive recording from him and decided to get it. Sure enough....dynamic drumming! 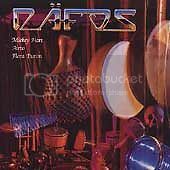 Dafos is a concept album. It features Mickey and the husband/wife team of Airto and Flora Purim. It's a mythical story of a country called Dafos and the adventure of exploring it. Surely, it must be somewhere in the South American area as you can feel an influence of Brazilian or latin music here. Maybe underground too or a lot of caves, is the feel. But it was a live recording in a unique way to a custom 2 track R-R. The recording engineer was none other than Keith O. Johnson of Reference Recording and HDCD fame. It was, as a matter of fact, issued by Reference long ago and it goes high when you see one! A couple of the songs feature extremely unique "instruments". One they called the "Beam" and was an aluminum I-beam with 12 bass piano strings stretched along its length and picked up by a very large magnetic pickup. Then the sound of it was amplified thru a big Meyer speaker system and recorded in an ambient fashion. The other was something created for Mickey for the Dead, called "The Beast". A circular frame of over 25 feet circumference from which a large group of drums are mounted. In the case of a song here, they actually suspended it and dropped it for the resulting sound! Robert Reina in an Absolute Sound review said about Dafos, "....this recording, more than any other on an excellent system will convince you there is a live performance taking place in your living room." And goes on to talk about the dynamic nature of what's done. "A friend with Entec subwoofres has described the sound alternately as 'someone picking up your house several feet and dropping it' or 'a UPS truck backing into the rear of the soundstage' ". The music is weird to most folks typicals, but if you like solo drumming and enjoy a latin feel, you might enjoy this. Crazy well recorded! Thanks for the recommendation Mark. Just ordered off Amazon. Cool Don. Really hope you like it! Got it bookmarked in my wish list- Thanks Mark! Recorded live with no overdubs in The Japan Center Theatre in San Francisco, CA. All miking was done with stereo pairs. ...no equalization, editing, reverberation, overdubbing, or other signal processing was used except on "Psychopomp," where stereo digital reverberation was employed. F-ing AMAZING Recording! Recorded October 24, 1982 and March 21, 1983. Wish more stuff was recorded with the honesty of plain ol' stereo mic pairs! And then left unmolested.